Here are the FINAL results for the PTC Rotary Elementary Grand Prix as of 5/15/15 updated through the 2015 Crabapple Elementary 5K. Please note that the Cleveland Elementary 5K was cancelled due to inclement weather, so no points were awarded for that race. Click here for the final 2014-2015 standings (finalized on 5/15/2015). The 2015 Annual Awards luncheon for the Rotary Elementary School Grand Prix will be held on Thursday, May 28th, at 12:00 noon, at the Wyndham Hotel and Conference Center in Peachtree City. All participants who finished in the top three in each age group, as recorded on the Peachtree City Running Club website, are invited to attend. The luncheon is free of charge to all runners who finished in the top three and for awardees age 16 and under, one parent is also admitted at no charge. Additional parents or guests are $15 per person. Each age group winner will receive a customized plaque with the individual runner’s photo on the plaque. Members of the press normally attend so a group photo will usually appear in local papers. The Rotary Elementary School Grand Prix is a series of 16 races spread over the entire school year, with each race serving as a fund raiser for the individual school hosting the race. 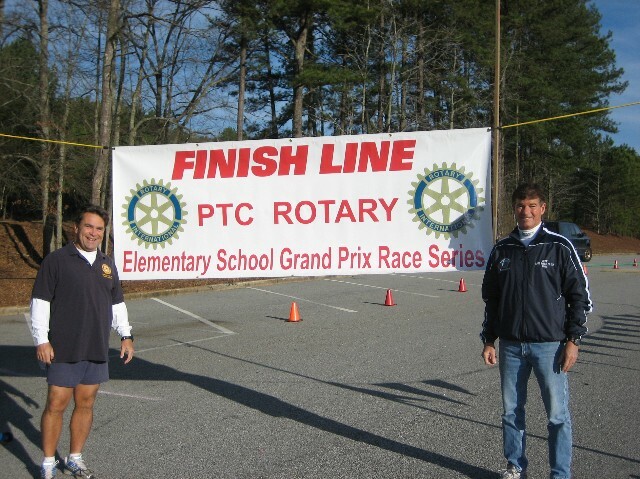 The series is a joint project of the Peachtree City Running Club and the Rotary Club of Peachtree City. If you have not had your photo already taken please contact George Martin.